The new C3 Advance autoclave provides the most effective and affordable means available for complying with all the guidelines for instrument sterilisation. The triple pulse vacuum system ensures the safe and effective sterilization of all types of instrument load, for all healthcare applications. C3 Advance autoclaves incorporate a number of key features and benefits designed to make instrument sterilization easier and more efficient than ever before. The door is designed to open at the touch of a button and can be pushed closed just as easily. The touch sensitive control panel is simple to operate - the press of a button selects the cycle, another starts it. The 16 & 22 litre chamber has capacity to sterilize a wide variety of loads. 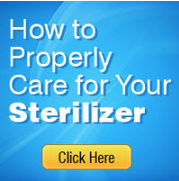 Ensures more effective air removal allowing all loads to be sterilized safely and effectively. 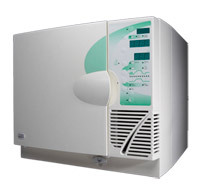 Gives you peace-of-mind, proving the autoclave continues to operate effectively at all times. Prevents the build up of contaminants within the reservoir, allowing for easy cleaning and, a more hygienic starting point for each sterilisation cycle. ensures that if there is a problem with the vacuum system, the sterilising cycle will not operate. Intended Use: The Non Vacuum Autoclaves are intended to sterilize unwrapped solid instruments and non-porous loads (excluding lumened instruments, and dental handpieces).